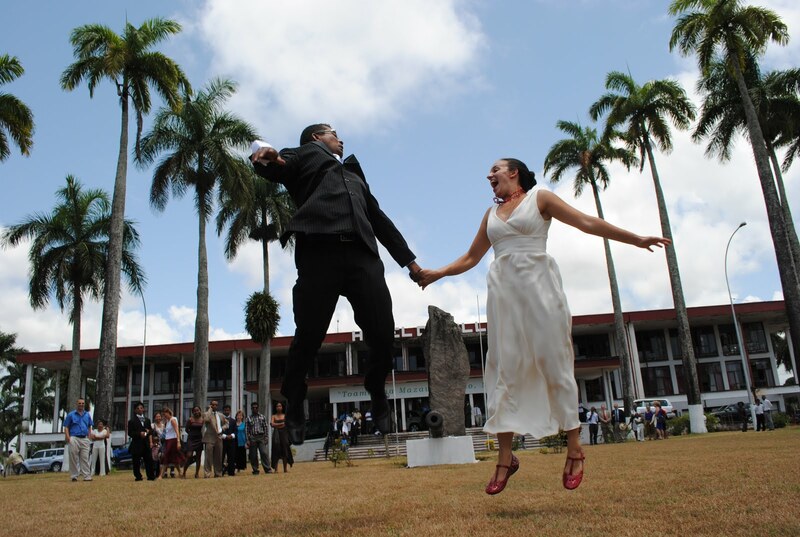 I got married in Madagascar in October 2010 – not as an exotic destination wedding, but because my hubby is Malagasy and we will be living here for the next couple years while I conduct research for my PhD in cultural anthropology. 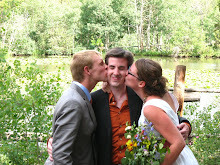 I don’t have a lot of practical advice about budget wedding planning that will apply to many readers of this blog. So I’d like to take this as an opportunity to step back a little and reflect on how my experience has given me some perspective on what makes American weddings unique, and what I learned from getting married in a completely different cultural context. I love reading this blog, and other resources like it that encourage brides to be independent and think outside the box, and not blow their life-savings on their wedding. I also have indulged in the guilty-pleasure of reading bridal magazines and doodling around Macy’s bridal registry website. And while in most ways these two kinds of resources are very different, they have some central similarities: a focus on the individual and a search for control. These factor into American weddings, be they quirky budget to-dos or extravagant country club affairs, since a wedding is seen as an opportunity to express one’s unique individual identity, and couples try to control the details of their wedding so that it feels right to them and shows other people their values and interests. I’d never really thought about this much until I got married in Madagascar, where both concepts – individualism, and the goal of control – are, if not absent, then VERY different. In Madagascar, the focus is on relationships rather than individuals. Your identity is more about the relationships you have with others than your personal traits and quirks. A great example is names: once you are an adult and have children, you are no longer known by your first name but as “Mom-of-so-and-so” or “Dad-of-so-and-so.” This is very different from America’s focus on individual identity coming from your past accomplishments, your hobbies and likes, and your future goals. I think I was also (overly) sensitive to the customs and expectations of my fiancé and my in-laws, since I wanted to be considerate as a foreigner and a future anthropologist. If I had gotten married in my own country, I probably would have advocated a lot more for my own wishes, but I found myself leaving lots of major decisions to my fiancé and his family. In Malagasy culture, respecting your elders and your extended family is very important, as is honoring guests and being generous. There is also a different cultural view of what is aesthetically pleasing -- since Madagascar is a poor developing country where a majority of people live on less than $2 a day, manufactured items and anything with a little glam is preferred. That means that anything "homemade" or "DIY" that might fly in the states would not go over well here. 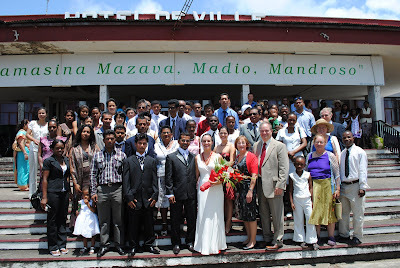 Also, many Malagasy people get married through traditional ceremonies only involving the two families or forgo an official wedding altogether due to the expense ... so there was a certain amount of social pressure to host a big lavish party since we were actually having a "modern" wedding, and I as an American am relatively wealthy compared to most people in Madagascar. 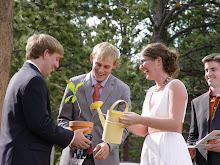 As a result, my wedding was VERY different from what I personally would have wanted. My ideal wedding would have had wooden rings, linen suits, an informal outdoor ceremony and reception on the beach, handpicked wildflower bouquets, and about 50 guests. In my real wedding we exchanged gold rings in front of almost 200 guests in a city hall, and then drove in a parade of air-conditioned SUVs to a beach-side hotel for a seated dinner reception. Whoa! 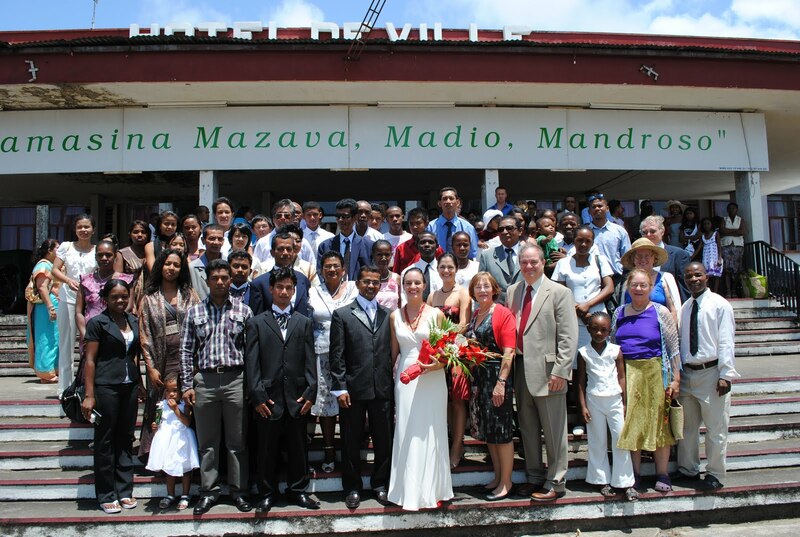 As a result, it did not feel like MY wedding at all … but like OUR wedding, “our” meaning me, my fiancé, my many in-laws, and my adopted country of Madagascar. But unlike some brides who are frustrated when their weddings get high-jacked, I found the experience of giving up control very liberating and fulfilling in the end. By respecting the wishes and expectations of other people, the wedding became a manifestation of my relationships to those people rather than an expression of my individual personality. I am not exactly sure what lessons other people can take from my experience. On the one hand, I think it is important to respect customs and the expectations of others. On the other hand, there are a lot of American wedding customs that are frankly expensive (embossed invitations, floral decorations) or outdated (“giving away” the bride, the garter toss). If I’ve learned anything from my anthropology classes, it’s that cultures are always changing, and customs are never applied universally. So I am NOT saying that you should always bow to the wishes of your mom, or your mother-in-law, or society in general, if it imposes exorbitant costs or just plain feels wrong. But if you do find it difficult to control your wedding so that it reflects your own individual personality and desires, here’s my advice: take a step back to get some perspective and breathe. You may find that relinquishing some control, and having a wedding that reflects not just you and your fiancé but other people in your lives or the culture(s) from which you come, might not be such a bad thing. Any other thoughts or experiences for negotiating cross-cultural expectations in the wedding planning process? Laura is working towards a PhD in anthropology and currently conducting her dissertation research on rural-urban migration in eastern Madagascar. 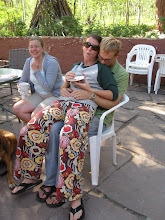 She writes about her experiences with fieldwork and cross-cultural romance at her blog Going Native. REMINDER: Registration is now open for the next Purposeful Conception Course: Preparing Your Mind, Body, and Life for Pregnancy, which starts on April 3. Register today! I loved reading this, especially because it shows that it is the getting married that is the important thing, not the wedding itself. The thought of cementing the relationship not just between the couple but also between them and other members of the family is nice. All the best to Laura and her husband! wow, laura, thank you for this post! 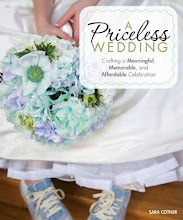 it's perfectly in line with the values sara advances that make me love this blog so much-- thoughfulness, connection, family, community, intentional living-- and yet presents a totally different take on weddings. i thoroughly enjoyed it and admire your perspective! Thanks y'all! Glad you enjoyed it and got something out of it. All my best to you, too! How Do I Love My Partner?